Home › Organics › How is the organic starch potato growing at Satakunta jail? How is the organic starch potato growing at Satakunta jail? 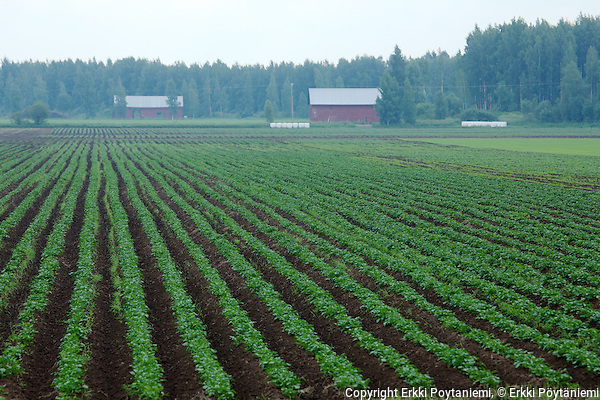 In the end of May we visited Satakunta jail’s organic farm in order to photograph the planting of the potatoes. Now I visited the same place with Kai Kreuzer from organic-market.info. Unfortunately it had been recently raining so there was no machine work going on this time. Otherwise we could have seen the harrowing of the potato rows but now it had been done already a few days ago. This time farm manager Pertti Saari showed us around. 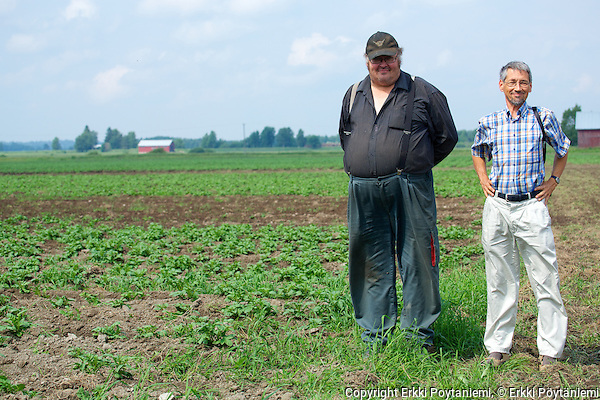 He told us that cultivating potatoes is quite effective against coach grass – a common weed in Finland. Harrowing the rows itself is effective but especially the fact that the harvester digs up also the roots of coach grass which remain on the surface and dry out. Apart from the harm done by the 70 mm shower right after planting to some lower parts of the field the potato fields look good. But there is still at least 10 weeks before harvest so let’s hope the weather keeps good and that potato blight (Phytophthora infestans) doesn’t attack too early. Potato blight is the main reason for the smaller yields in organic potato cultivation as there is almost nothing a organic farmer can do about it. Even conventional farmers have to apply increasing numbers of fungicide sprayings as the blight keeps deve ore resistant to the chemicals. Satakunta jail’s farm manager Pertti Saari and organic-market.info Kai Kreuzer. Satakunta jail has 215 ha organic cultivation of which 15 ha is this years organic starch potato contracted to Finnamyl. This field was planted on 30th May.